The charming Regolo is made of beechwood and is also available in white lacquered wood. 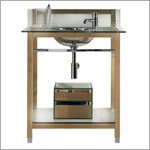 The 1/2" thick glass top accomodates a single hole faucet. The bowl is available in stainless steel. Complete the look by adding the matching mirror or shelving unit.